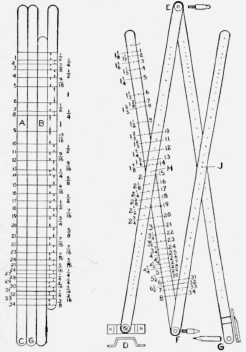 The pantograph consists of four pieces of wood, the dimensions depending somewhat on the size of the work to be drawn. A convenient size for ordinary drawing and enlarging is constructed of four pieces of hardwood, preferably maple, 3/16 in. thick and % in. wide, two of them 20% in. in length and the other two, 18 3/4 in. long. These are planed and sandpapered and the ends cut round. All four pieces are laid flat on a level board or bench top with their edges together so that the edges of the two longer pieces make right angles with a line drawn tangent to their ends. One end of one short piece is placed flush with the lower ends of the two long pieces, and one end of the other short piece flush with the upper ends, as shown. They should be clamped down solidly to keep them from moving while laying off the divisions. Light lines are drawn across their faces as designated by the dimensions. On these lines and exactly in the center of the pieces make small marks with a pencil point. Through the pieces A and B holes are drilled to snugly receive the body of a small screweye. The other two pieces are drilled with a smaller drill so that the threads of the screweye will take hold in the wood. The end C of the piece A has a metal stand made of brass as shown at D. This is fastened to the end of the wood with a small bolt. The hole should be a snug fit over the body of the bolt. The lower ends of the brass are drilled to admit thumb tacks for holding it to the drawing board. The joint at E is made of a suitable binding post that can be procured at an electrical shop, the shank below the two joined pieces to be the same length as the height of the metal stand D. The end should be filed round and polished so that it will slip over the board or paper easily. The stylus or tracing point F is made of another binding post, in the same manner, but instead of a rounding end a slightly blunt, pointed end is filed on it. The end of the piece G is strengthened by gluing a small block of the same material on both upper and under side. A hole is then made through them to receive a pencil rather tightly. The holes, as will be seen, are numbered from 1 to 34. At the crossing of each pair, H and J, the screweyes must be set in the holes numbered alike on both piece's of each pair. This will insure the proper working of the parts. The other numbers designate how much the instrument will enlarge a picture or reduce it. On the pair not numbered in the sketch the numbers run in the opposite direction. The end C is fastened to the left side of the drawing board, the picture to be enlarged is placed under the stylus or tracer point, and the paper under the pencil point G. Move the tracing point over the general outline of the picture without making any line before starting, so as to make sure that the paper and picture are located right. It is then only necessary to take hold of the pencil and move it over the paper while watching the tracer point to keep it following the lines of the picture. To make a reduced picture, the original is placed under G, the tracer point changed to G and the pencil to F.